Award winning sixteen-year-old American pianist, Drew Petersen, has performed solo, concerto, and chamber music recitals in both Europe and the United States. He was presented in performances at Carnegie’s Weill Recital Hall at the ages of five and six. Among his other performances are recitals at the Musica e Arte Festival in Tolentino, Italy, Verbier Festival in Verbier, Switzerland, Euro Music Festival in Leipzig, Germany, as well as performances in New York City at Steinway Hall, the Rose Theater at Lincoln Center, Donnell Library and Greenwich House of Music. In 2003, Drew was presented by Steinway & Sons for their 150th Anniversary in a solo recital. In 2006, Drew was heard on NPR’s radio program “From the Top” featuring the nation’s most gifted young classical musicians. In 2008 Drew won both the Manhattan School of Music Concerto Competition and the Yonkers Philharmonic Concerto Competition. In 2009 he won First Prize in the Friday Woodmere Young Artists Competition and he was featured multiple times on the McGraw-Hill “Young Artists Showcase,” hosted by Robert Sherman and aired on New York’s WQXR. He also received a scholarship from the Chopin Foundation of the United States for rendering stylistic interpretations of a variety of Chopin’s solo piano works. Drew also enjoys chamber music and won the Lincoln Center Chamber Music Society’s competition in May 2005 as a member of a piano trio and in summer 2008 was heard live on French radio, France Musique, as a member of a chamber group. In July 2004, at the age of ten, Drew was presented in his own recital as part of the Music Festival of the Hamptons in Bridgehampton, NY and was then invited back in July 2005 to perform a Mozart Piano Concerto with Maestro Lukas Foss conducting for the opening night gala. Drew became the focus of a documentary titled “Just Normal” leading up to this performance which was produced and aired on Plum TV. Drew has participated in several summer music festivals including the Music Festival of the Hamptons, Meadowmount, Tanglewood, and, most recently, the Euro Music Festival Academy in Leipzig, Germany. In summer 2008, Drew was a participant in the Verbier Festival Academy where he studied with Claude Frank, Menahem Pressler and Gabor Takacs-Nagy. At 14 years of age, Drew was the recipient of the Verbier Festival Academy Tabor Piano Award 2008. 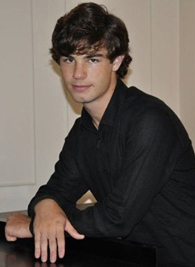 Drew Petersen began piano lessons at the age of five and currently attends the Manhattan School of Music Precollege Division in New York City where he studies piano with Miyoko Lotto, conducting with Maestro David Gilbert and chamber music with André Michel Schub. Drew has been selected and has participated in master classes with Emmanuel Ax, Claude Frank, Menahem Pressler and André Michel Schub.